Some moon have gone astray at times of revolution or political transition. 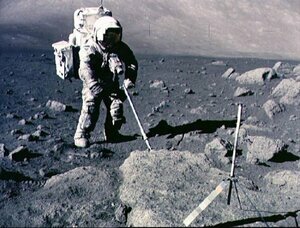 The US national archives show that a rock was presented to the late Romanian dictator, Nicolae Ceausescu, but Gutheinz [Joseph Gutheinz Jr, the Texas-based lawyer and former Nasa agent, who has become known as the “moon rock hunter”] believes it was sold after his execution. Then there is the mysterious tale of how – after a fire at an observatory in Dublin – Ireland’s Apollo 11 moon rock ended up lying in a rubbish dump, after apparently being thrown out with the rest of the debris. “It’s still there under a couple of tonnes of trash. That could definitely be worth over $5m (£3.1m). I’ll tell you where it’s at. It’s in the Finglas landfill dump in Dublin,” Gutheinz says. And don’t spare the horses. Posted in Misc and tagged Finglas, moon, NASA at 8:04 am on February 20, 2012 by Ewok.